Whether you love them or hate them, Toby Jugs and Character Jugs have a way of getting under your skin. 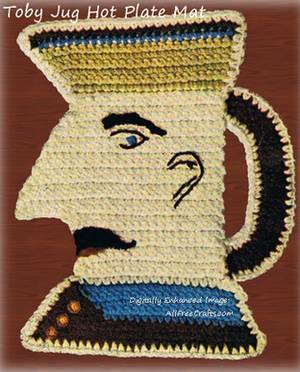 This hot plate mat pattern, dating from 1950, features the head and face details of a character mug. It’s a great kitschy addition to any toby jug collection. Read the sidebar, below, for more about viewing and collecting toby jugs. With Brown ch 30, sc in 2nd st from hook, 1 sc in each remaining st of ch, ch 1 to turn all rows. 2nd Row- Working in sc, decrease 1 sc at the beginning and end of row (to decrease: insert hook in st, pull loop through, insert hook in next st, pull through, yarn over and work off all loops at one time). 3rd Row- Work even, drop Brown, attach Blue (when changing Color always complete the last half of st with next Color). 4th Row- Keeping Brown in back of work and working over Brown decrease in 1st 2 sts, 1 s c in each of the next 17 sts, drop Blue, pick up Brown, 1 sc in each of the next 6 sc, Iecrease in next 2 sts. 5th Row- 1 sc in each of the next 6 sc, drop Brown, pick up Blue, 1 sc in each remaining sc. Largest collection of Toby and Character Mugs in the World; free admission to the museum located in Evanston, Illinois, USA. Beer jug or mug in the form of a stout old man wearing a three-cornered hat. Mid-19th century: pet form of the given name Tobias, and said to come from an 18th-century poem about Toby Philpot (with a pun on fill pot), a soldier who liked to drink. Gallery of Toby Jugs, brief history, and Toby Jugs for sale. 6th Row- Decrease in 1st 2 sts, 1 sc in each of the next 17 sc, drop Blue, pick up Brown, 1 sc in each of the next 3 sc decrease in next 2 sts. 7th Row- 1 sc in each of the next 3 sc, drop Brown, pick up Blue, 1 sc in each remaining sc. 8th Row- Decrease in 1st 2 sts, 1 sc in each of the next 18 sc, break Blue, pick up Brown, decrease in next 2 sts, break yarn, do not turn. 9th Row- Attach Cream in 2nd st from beginning of row, sc in same space, 1 sc in each of the next 17 sc, turn. 10th Row- 3 sc in 1st sc, 1 sc in each remaining sc. 11th Row- Working in sc decrease 2 sc at end of row. 12th Row- Decrease in 1st 2 sts, 1 sc in each remaining sc. 13th Row- Increase 1 sc at end of row. 14th Row- Increase 1 sc at beginning of row. Work 1 row even. 16th Row- Same as 14th row. 17th Row- Work same as 13th row, ch 7, turn. 18th Row- Sc in 2nd st from hook, 1 sc in each of the next 5 sts of ch, 1 sc in each sc. 19th Row- Decrease 1 sc at end of row. Work I row even. Repeat the last 2 rows 4 times. 29th Row- Decrease 2 sc at end of row. 30th Row- Decrease in 1st 2 sts at beginning of row. 31st Row- 1 sc in each of the 1st 19 sc, sl st in last sc. 32nd Row- Skip the sl st, 1 sc in each remaining sc. 33rd Row- l sc in each sc and 1 sc in ch 1 at end of row, break yarn, do not turn. 34th Row- Attach Beige in 1st sc, 1 sc in each sc working 2 sc in last sc. 35th Row- Increase 1 sc at the beginning and end of row. 36th Row- Increase 2 sc at end of row. Work I row even. 38th Row- Increase 1 sc at end of row. 39th Row- Increase 1 sc at beginning of row, break yarn, turn. 40th Row- Attach Blue and work same as 38th row, break Blue, do not turn. 41st Row- Attach Brown in 1st sc and work same as last row, break yarn. HANDLE: With Brown ch 5, sdc in 2nd st from hook (sdc: yarn over hook, insert in st, pull loop through, yarn over and pull through all loops at one time), sdc in next st of ch, 1 sc in next st, sl st in last st, ch 1, turn. 2nd Row- Sl st in 1st st, 1 sc in next sc, 1 sdc in each of the next 2 sts, ch 1, turn. 3rd Row- 1 sdc in each of the next 2 sdc, sc in next sc, sl st in next sl st. Repeat the last 2 rows 3 times. 10th Row- 1 sc in each st, ch 1, turn. Repeat the last row 11 times. 22nd Row- Same as 2nd row. 23rd Row- Same as 3rd row. Repeat the last 2 rows 3 times, break yarn. Sew handle in position. With Cream work a row of sc all around all Colored sections. With Black embroider eye and ear in an outline st. With Black embroider mustache and eye brows with satin st. With Red “Star” Six Strand Embroidery Cotton embroider mouth in satin st. With Blue embroider eyes in satin st.
BUTTONS: With Yellow ch 2 and work 8 sc in 2nd st from hook, join, break thread. 2nd Row- Attach Golden Brown and work 2 sc in each st, join, break thread. Work 2 more buttons in same manner. Sew in position. SOURCE: Star Book No. 70, Hot Plate Mats, American Thread Company, 260 W. Broadway, New York 13, N.Y., Copyright 1950.